Even if you are a college coach, or your high school association has different rules than Alan’s I know there are some points he makes that you can adapt to your program. He also has posted a video of an agility drill that can be done with or without a basketball. In case you missed these articles, here are a couple of other articles to help you finish up your pre-season. At the high school level, it varies tremendously from state to state, as to what you are allowed to do with your players in the pre-season. Therefore, simply do what you can, with what you have, where you are. I don’t believe in making excuses and I don’t believe in cheating the rules. At DeMatha Catholic High School, we are governed by the rules of the Washington Catholic Athletic Conference (WCAC), which fortunately for us, allows us to work with our players in just about every capacity possible. The only exception is we are not allowed to hold a ‘team practice’ until November 6th. We are allowed to conduct strength & conditioning workouts, skill workouts and monitor play (‘open run’). Yes, we are very thankful to be in such a progressive conference. I sympathize for those that aren’t. I get numerous inquires via email and social media asking about our pre-season program. Every offensive player must be in the front court when a point is scored. If not, the basket does not count and it is a turnover. What happens on a quick steal or a long outlet pass? You better sprint!! Every defensive player must be in the front court when a point is scored. If not, the basket counts and the offensive team receives another possession. This helps eliminate standing and pouting after a turnover, missed shot or no foul call. Defense calls fouls. No arguments. No exceptions. However, we strongly encourage our players to limit calling fouls, as we want them to get used to playing with severe contact. Games are played to 21, with 2’s and 3’s. All 10 players are expected to call out the score on every possession. We choose to play to 21 because it simulates the length of a quarter (8 minutes-ish) and creates a superior platform for conditioning. It also allows for a comeback (if one team jumps out to a 12-2 lead, you still have plenty of time to come back and win). The player that scores the game winning point must immediately step to the free throw line and make a free throw. If so, the game is over. If not, the game-winning basket is erased and play resumes. I wish you the best the remainder of this pre-season. PS: Need a great pre-season drill that works on change of direction, deceleration and ball handling? 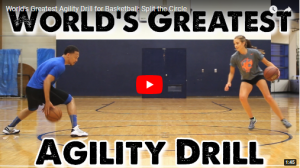 Here is the World’s Greatest Agility Drill! This is not a high school. THis is a Division I model and to publish this as a high school model is not attainable for over 90% of the programs out there. I can’t believe that you can do this much in a preseason! This is more than I can do as a college coach (Division III) and as a coach that coached for 20 years at the high school – way more than we could do there, nor should we do there. Writing an article like this is not applicable to 90% of the high school programs out there. THis isn’t necessarily a healthy model for the players. Burnout. How can they play more than one sport? Overuse on their bodies? Nor is it healthy for most coaches. Most high school coaches are also teachers. If they are spending 3 – 4 hours a day working during preseason (tho I appreciate you take Sundays off) when do they have time for their families? Extra teaching time? Time for themselves? This is a Division I approach to basketball. I enjoy most of your articles but one like this sets up unrealistic expectations for young or new coaches to high school that think that this is what they have to do for a stipend that is usually less than minimum wage and with parents and administration that can offer minimal support.